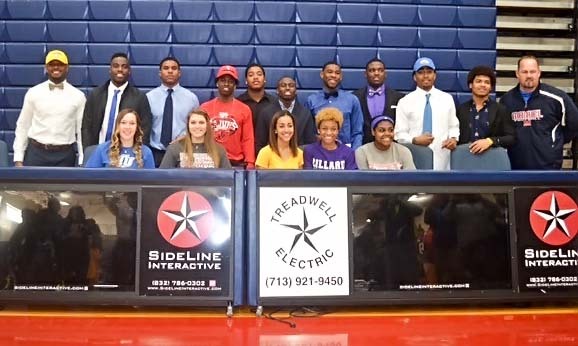 MANVEL — Manvel head coach Kirk Martin saw 10 of his football players sign national letters-of-intent to continue their education and football careers on, Wednesday, Feb. 4 on National Signing Day. He indicated there may be a few more players who will sign before the end of the school year. Martin has had over three dozen players sign college football scholarships since the school opened. The success that Manvel has experienced under Martin has attracted major colleges from all across the country to consider his players at the next level. Martin has been at the helm of the Mavs since the day the school opened in 2007. Martin has an overall record of 71-20 and 38-10 in district action. The Mavs have won the past four district championships, 24-4A (2011), District 22-5A (2012, 2013), and District 22-6A (2014). Martin has been named district "Coach of the Year" several times and has also received "Coach of the Year" honors from the Touchdown Club of Houston in 2011. Manvel closed out the 2014 football campaign with a 14-1 mark falling to Katy in the Class 6A Region III finals for the second consecutive year. Signing football letters-of-intent are: Todd Maxwell-WR-Texas A&M Commerce; BJ Ojo-LB-Montana State; Collin Scott-LB-Louisiana Tech University; Gary Haynes-WR-Louisiana-Lafayette; Shane Jackson-LB-New Mexico State University; Qyalan Clay-RB-Concordia University; Vincent Beasley-WR-Concordia University; Stephen Scott-DT-Prairie View A&M; Will Lockett-DB-UCLA; and Cameron Batts-LB-Concordia University. 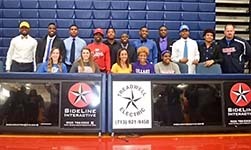 Other signees included: Cory Jo Martin-VB-setter-Lubbock Christian University; Shelby Estes-VB-setter-UT Tyler; Bailey Jefferson-VB-Libero-Southern University; Kahlia Columbus-Track-Dillard University; and Alejah Thomas-VB-middle blocker-UT Tyler.